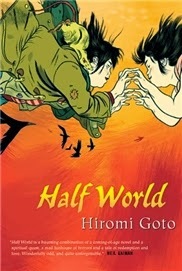 My contribution to A More Diverse Universe is a discussion of Half World by Japanese-Canadian author Hiromi Goto with none other than our excellent hostess herself. 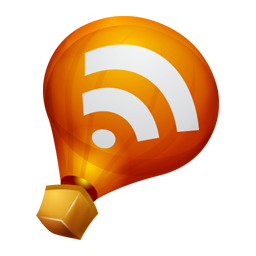 Talking books with Aarti is always a lot of fun, and the co-reviews we’ve done over the years are among my favourite blogging projects. So it came as no surprise to me to have really enjoyed talking about Half World and the ways in which it interrogates the Chosen One narrative and traditional models of heroism with Aarti, even though in the end neither one of us was a huge fan of the book. Half World is about Melanie Tamaki, a human girl with a strange affinity with crows. When Melanie’s mother goes missing, she discovers that her parents come from a place called Half World, a static, limbo-like place populated with nightmares straight out of a painting by Bosch. To save her mother, Melanie must follow her into Half World and hope against hope that they make it out alive. Ana: So, I think it’s safe to say that Half World turned out to be quite a bit different from what either of us expected. I hoped to find a hidden gem in Hiromi Goto’s work, but sadly that didn’t turn out to be the case for me. I still appreciated some of what the book was doing, though, and I’m excited to be discussing it with you! Do you want to start by telling me what about Half World was different from what you expected and how you felt towards it overall? Aarti: Well, as I told you, I thought Half World was a graphic novel, so opening up to the first page and finding that it was a novel with intermittent illustrations was definitely the first surprise! I also didn’t expect so much of the book to be taken up by very detailed descriptions of hideous, nightmare-ish characters and places. Goto spent a lot of time on gory descriptions of people getting swallowed whole, and it just really turned me off. I guess it makes sense if you consider that the target audience is maybe teenage boys? But still… it was too much for me to take. That probably gives a hint as to what my overall thoughts were. I was “meh” about it the whole way through. I didn’t feel drawn to Melanie, and she was the only person in the story with a personality. Everyone else was devoid of color, much like the half-world in which they lived. I did appreciate Goto’s attempt to showcase Melanie’s “soft strength,” as described by the quote at the start of the book. Do you think Goto was successful in doing this? Ana: I can definitely see how not connecting with Melanie would be a deal-breaker, as so much of the story hinges on her. I can’t say Half World exactly worked for me either, but this is one of those books that I appreciate intellectually even if I wasn’t hooked emotionally. I can see what Goto was trying to do, and I like it, even if the end result wasn’t a book I’m in love with. One of the things I liked was the fact that Melanie is such an unusual heroine — and this has to do with the "soft strength" you mention, among other things. I like how she’s described as not being traditionally pretty, not doing brilliantly at school, not being exactly popular. This last one is not so uncommon, but most of the time the unpopular underdogs stories have us sympathise with are secretly brilliant or hiding incredibly talents or just… special in some way. Melanie is… well, in a way Half World *is* a Chosen One narrative, but it’s a narrative that’s self-conscious about genre tropes and tries to subvert them. Melanie saves the world by simply making whatever choice feels right to her. She’ special in the sense that she’s a unique human being, but the kindness that she shows Baby G and that breaks the cycle (I’m trying not to be too spoilery, but I don’t think this is too revealing out of context) is something someone other than Melanie could have done, too. The emphasis is on the compassionate action itself rather than on the actor’s status as a special snowflake, if that makes sense. So to answer your question, yes, I did think Goto was successful. I think the book’s subtle redefinition of heroism is probably the most interesting things about it. I know you said above that you didn’t think the other characters were very fleshed out, but do you have any thoughts on Ms Wei? If so, I’d love to hear them! Aarti: I did like Miss Wei. I wish we saw more of her! I appreciated that Miss Wei was there to help and support but not to overwhelm the story. It isn’t as though she just dropped knowledge on Melanie randomly that came into use later on. She offered a lot of practical advice and help, such as providing transportation, but Melanie was the one who did all the work and made the difficult decisions. I liked that Goto made Miss Wei someone who removed obstacles but not someone who had a huge impact on specific characters. Ana: Oooh, that’s a great point! I guess when you have really useful and powerful helper character, you run the risk of making it so there’s nothing left for the protagonist to actually do — and this is an even greater risk when the helper is an adult and the protagonist is a child or young teen. But Ms Wei was great — like you said, she gave Melanie practical help and support, but she didn’t overshadow her choices or stand in the way when Melanie’s moment came. Do you think this was also the case with Jade Rat? Ana: Also, I have to say that I just love how we’re told Ms Wei was in mourning for her lifelong female partner with no fanfare whatsoever — her sexual orientation is just another fact about her and is in no way an issue. Hiromi Goto’s approach to diversity is awesome, and you can also see it in how Melanie is portrayed — she’s a young girl of Japanese descent who we’re told is not skinny or conforming to traditional definitions of beauty, but none of this is what her story is about. To be clear, I’m not saying we shouldn’t tell stories where the ways in which people are made to suffer because of racism and sexism and fat-phobia take centre stage, but it’s also nice to have a story where a girl like Melanie gets to do out and do stuff and just live her life, instead of dealing with that 100% of the time. So yeah, well played, Ms Goto. I only wish I had enjoyed the book more overall. Aarti: Yes, I appreciated that, too! Ms Wei was a no-nonsense sort of person and that’s how she approached telling her story, too. And I agree with you on the sexism and racism and fat-phobio front, too. As Chimamanda Adichie says, we all can become trapped by hearing a “single story,” and it’s great that we got a different angle here. There were a lot of characters in this book, considering its length. But one non-character that stood out to me was the Magic 8 ball. What did you think of that instrument? Ana: The Magic 8 Ball (a gift Melanie is given just before the start of her quest and which is meant to help her) was really interesting. Initially Melanie is frustrated because it won’t give her concrete answers, but its vagueness is kind of the point. Traditionally Magic 8 Balls are supposed to tell you what’s going to happen in very simple yes or no terms, but one of the themes of Half World is that the future is not set in stone. Melanie can’t be given specific answers about what’s going to happen because it hasn’t happened yet, and as much as everyone in Half World is trapped in inescapable cycles of suffering, the whole point is that such cycles can be broken. So when the Magic 8 Ball tells Melanie, "What your enemies inflict upon you will you inflict in return?" it’s actually being as helpful as it could possibly be — rather than telling her what to do, it’s giving her sensible advice about how to make a decision when the time to make one comes. You can’t decide to do a or b because it will inevitably result in x or y, but you can decide to live your life in a certain way (with integrity and compassion) and hope for the best. It was really interesting to me how Half World is a prophecy story that examines the underpinnings of the notion of prophecies. And of course, I loved the fact that this is a book that believes in second chances — our very creepy villain, Mr Glueskin, is taken back to a point in time before he became a villain so that the cycle of violence and suffering he’s a part of can be broken. This idea that people are not inevitably evil has social and political ramifications and is quite close to my heart. Any thoughts on this you’d like to share? Aarti: I thought that was important as well. It implies that Mr. Glueskin is not inherently evil, but that he became cruel and unsympathetic due to circumstances. And everyone in half-world said that he was the person who made Half-World somewhat more bearable, by stretching out the time and space that people have to accomplish things, meaning that they had a bit more control over their lives than they would have otherwise. So clearly, he had a lot of potential and just used it in a way that was less than ideal. Compare him to Melanie, who by all “normal” standards of academic ability, athletic prowess, beauty, etc., would not be considered a high-potential person, but then managed to do so much for so many people. I loved that! I love the idea that all of us have greatness within us and if we’re given a chance to shine, our strengths will come out and change the world (for better or for worse). Ana: I really like what you say about Melanie, and I also love that the book so clearly gets behind the idea that no one is inevitably great or evil. We could all end up doing great or terrible things depending on the cards life deals us and the support we can or can’t find at the right time. Also, I think that one of the reasons why Melanie shines and makes such a difference is that she’s kind. This is not a quality that’s traditionally valued in the context of strength and success, but Melanie shows that there are perhaps different ways of defining this. So far we’ve discussed the things we appreciated about Half World, though we both started this discussion by saying we weren’t exactly fans. As often happens, talking about the book in more detail with you did make me appreciate it more, though that appreciation remains mostly intellectual — sadly, this is not a book that grabbed me by the heart, and I kind of want to make sense of the reasons why. You said above that one of the things that bothered you was that it was so gory, but was there anything else? For me, there was the feeling I had all along that Half World was somewhat written down. I can’t quite put my finger on what exactly, but there was something about the writing that lacked subtlety and grace. And I don’t like justifying this in terms of the age group it’s meant for, because I can think of dozens of children’s books that most definitely don’t make me feel this way. Did you get this impression too? Aarti: I think for me, the goriness made me feel like it was written for a less mature audience. I could see 10-year-old boys being thrilled with the idea of a man being eaten by something like a boa constrictor. There was certainly no subtlety or grace in that! For me, the reason the book failed was that Goto seemed to care more for the small details than for the overall story and message. She spent so much time describing Melanie climbing up stairs, or the grotesque features of the people who lived in Half-World, but she did not devote nearly as much time to developing key characters, like Melanie’s parents. For example, we hear from both Melanie and her mother that Melanie is the best thing that ever happened to her mom. But there is zero proof of that for the vast majority of the book. We don’t get any moments between the two of them to make the relationship come to life, and I missed that. Similarly with the whole crow theme. Crows have a large part to play in the book and they seem to love Melanie, but we don’t get any insight into the background for that at all. It all made the book feel a bit hollow to me. I know that I am quite partial to very well-developed characters and a well-built world, though. Did these parts of the book bother you, too, or not as much? Ana: I do wish pretty much everything about the story had been more fleshed out. Half World is pretty fast-paced, and while that’s not necessarily a bad thing in itself, in this case it came at the expense of emotional resonance. As you point out, we are told the relationships between the characters are significant, but we don’t really get to see this for ourselves. For example, I could tell that the final scene with Melanie and her parents was supposed to be moving, but only in an intellectual sort of way, because reading it unfortunately left me completely cold. Oh well — can’t love them all, right? I’m still glad to finally have given Hiromi Goto a try, and I enjoyed our conversation more than the book itself. Thank you again for hosting A More Diverse Universe, and I look forward to reading another book with you soon! Maybe because I didn't have any expectations going into this one, but I seem to have enjoyed it more. Not the best book I've read but I was entertained enough to be pulled through to the end. I also appreciated Melanie's quiet heroism and was thoroughly grossed out by the creatures of Half World. And really? Mr. Glueskin? Yick. My favorite thing about this book was reviewing it with you :-) So glad we got to do another buddy read; it really just made me want to do more of them as I think I got so much more from the book due to our discussion. If only we had known Eva was reading it at basically the same time! Interesting discussion, even though I haven't read the book. Trish's review made me want to read it, but now I'm not sure! Still possible! The crow bit made me perk up all interested like :) but then it didn't really seem to work for either of you. Although it still sounds interesting I won't be rushing out to find it. I've been trying to find a copy of this one since the last diversiverse. It's sad that ya'll didn't love it, but it sounds like a book that would really hit my id.